Ladislaus the Posthumous is crowned the king of Bohemia in Prague. Ladislaus the Posthumous, known also as Ladislas was Duke of Austria, and King of Hungary, Croatia and Bohemia. He was the posthumous son of Albert of Habsburg with Elizabeth of Luxembourg. Albert had bequeathed all his realms to his future son on his deathbed, but only the Estates of Austria accepted his last will. Fearing an Ottoman invasion, the majority of the Hungarian lords and prelates offered the crown to Vladislaus III of Poland. The Hussite noblemen and towns of Bohemia did not acknowledge the hereditary right of Albert’s descendants to the throne, but also did not elect a new king. After Ladislaus’s birth, his mother seized the Holy Crown of Hungary and had Ladislaus – known as Ladislaus V in Hungary – crowned king in Székesfehérvár on 15 May 1440. However, the Diet of Hungary declared Ladislaus’s coronation invalid and elected Vladislaus king. A civil war broke out which lasted for years. Elizabeth appointed her late husband’s distant cousin, Frederick III, King of the Romans, Ladislaus’ guardian. Ladislaus lived in Frederick’s court, where Aeneas Silvius Piccolomini wrote a treatise of his education. After his mother died in late 1442, Ladislaus’ interests were represented by a Czech condottiere, John Jiskra of Brandýs, in Hungary, and by the Czech Catholic lord, Ulrich II of Rosenberg, in Bohemia. Ladislaus’ rival in Hungary, Vladislaus, fell in the Battle of Varna in November 1444. The next year, the Diet of Hungary offered to acknowledge Ladislaus as king if Frederick III renounced his guardianship. After Frederick III rejected the offer, the Diet of Hungary elected John Hunyadi regent in 1446. In Bohemia, the head of the moderate Hussites, George of Pod?brady, took control of Prague in 1448. The Estates of Austria forced Frederick III to resign the guardianship and hand over Ladislaus to them in September 1452. Royal administration was formally restored in Hungary after Hunyadi resigned the regency in early 1453, but he continued to control most royal castles and revenues. Ulrich II, Count of Celje became Ladislaus’ main advisor, but an Austrian baron, Ulrich Eytzinger, forced Ladislaus to expel Celje from his court. Although Ladislaus was crowned king of Bohemia on 28 October 1453, Pod?brady remained in full control of the government. During the following years, Eytzinger, Hunyadi and Pod?brady closely cooperated to mutually secure their positions. Ladislaus was reconciled with Ulrich II in early 1455. With the support of the leading Hungarian barons, Ladislaus persuaded Hunyadi to withdraw his troops from most royal castles and renounce the administration of part of the royal revenues. After the Ottoman Sultan Mehmed II decided to invade Hungary, Ladislaus and Ulrich II left the kingdom. The sultan laid siege to Belgrade. Hunyadi relieved the fortress on 22 July 1456, but he died two weeks later. Ladislaus and Ulrich II returned to Hungary and tried to force Hunyadi’s son, Ladislaus, to renounce all royal castles and revenues, but Ladislaus Hunyadi murdered Ulrich II on 9 November, forcing Ladislaus to grant an amnesty to him. However, most Hungarian barons were hostile towards Ladislaus Hunyadi. With their support, Ladislaus captured him and his brother, Matthias. After Ladislaus Hunyadi was executed in March 1457, his relatives stirred up a rebellion against Ladislaus, forcing him to flee from Hungary. Ladislaus died unexpectedly in Prague. He was the last male member of the Albertinian Line of the House of Habsburg. Posted in Uncategorized	| Tagged 1453, 28 October, Ladislaus the Posthumous is crowned the king of Bohemia in Prague. 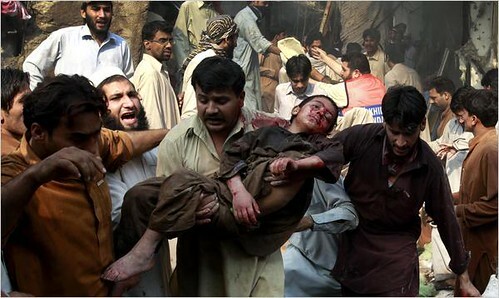 A bombing in Peshawar kills 117 and wounds 213. Militants in Pakistan and Afghanistan punctuated Secretary of State Hillary Rodham Clinton’s arrival here with deadly attacks on Wednesday, underscoring their ability to cause chaos even in the face of offensives on both sides of the border. In Pakistan, a devastating car bomb tore through a congested market in the northwest city of Peshawar, killing as many as 101 people, many of them women and children. Pakistani authorities said the attack was the country’s most serious in two years, and the deadliest ever in Peshawar, which has become a front line for Taliban efforts to destabilize the government through violence. In the Afghan capital, Kabul, Taliban militants stormed a guesthouse, killing five United Nations employees and three other people in a furious two-hour siege. The attack was meant to scare Afghans away from voting in a runoff election on Nov. 7 between President Hamid Karzai and his challenger, Abdullah Abdullah, a Taliban spokesman said. The violence cast a shadow over the visit of Mrs. Clinton, who was meeting with government ministers in Islamabad, 90 miles southwest of Peshawar, when news of the Peshawar explosion came over television screens. Mrs. Clinton immediately condemned the bombing, which in killing women and children in Peshawar seemed aimed at the very constituencies she has championed in her travels to other developing countries. “These attacks on innocent people are cowardly; they are not courageous, they are cowardly,” Mrs. Clinton said at a news conference with the Pakistani foreign minister, her voice raw with anger. Tchaikovsky’s Symphony No. 6 in B Minor, Pathétique, receives its first performance in St. Petersburg. Tchaikovsky dies nine days later. Benito Mussolini leads a march on Rome and takes over the Italian government. British Army forces arrive at White Plains, attack and capture Chatterton Hill from the Americans. This was knowns as the Battle of White Plains.